Below are the 12 coolest iPad accessories LAUNCH editors found using Pinterest, an online virtual pinboard where users share products and things found on the web. But one of these is a fake -- can you spot it? Answer at the bottom. 1. The iVictrola: Magnavox phonograph horn that houses the iPad to acoustically amplify the sound without any need for electricity.$895. 2. Nest iPad Stand: Provides a compact solution to mount the iPad and also hold small items such as keys, USB flash drivers and coins. Starting at $30. 3. The Movie Mount for iPad 2 lets moviemakers attach the device to a tripod for stability, hook up a microphone, use tele- and wide angle lenses and attach lighting. $70. 4. 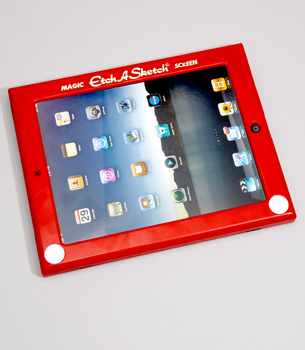 Etch-A-Sketch iPad case. $42. 5. Z3: iPad stand adjustable between 15 in and 4ft 6 inches. $189+. 6. Spinning Hat Typescreen allows users to type on their iPad using a traditional typewriter keyboard. $4.50+. 7. The FridgePad lets users magnetically mount their iPad to a refrigerator, featuring a slam-proof design. $53+. 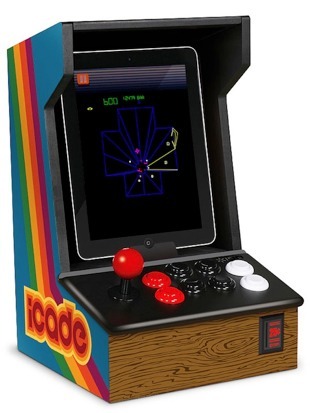 8. iCADE: iPad Arcade Cabinet. iPad connects to the iCADE via Bluetooth. The Atari Greatest Hits iPad App is fully compatible with iCADE. $99. 9. iPad Guy, a freestanding foam case for iPad and iPad 2 $39.95. 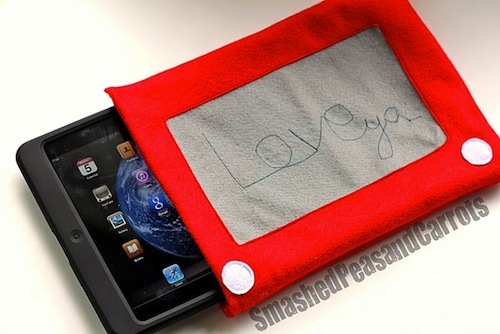 10. iLatch: iPad case that parents can connect to a backseat for kids to watch media on the iPad while on the road. Currently raising money on Kickstarter. 11. Crux360 iPad 2 Keyboard Case. Features four modes: laptop, movie, tablet and carry. $149. 12. Cinemin Slice Micro Projector. Serves as a dock for iPad and iPhone, and projects images up to 60 inches in size. $499. The fake? The Typescreen (no. 6).